Are you an Office 365 admin? 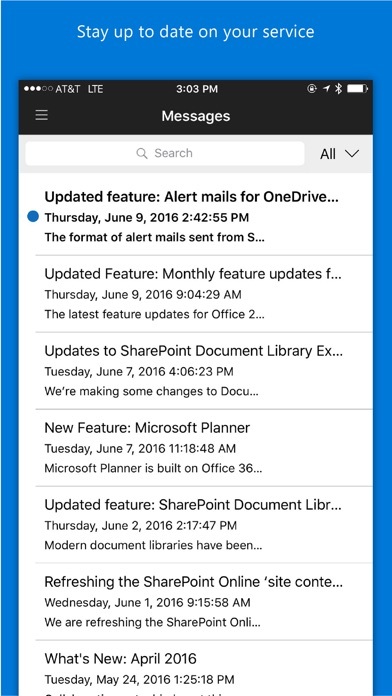 Then you need the Office 365 Admin app. 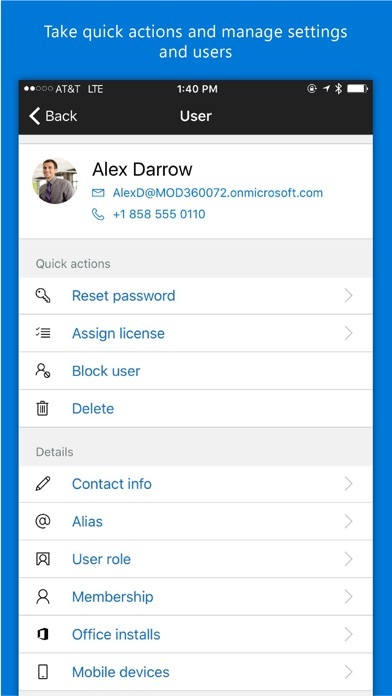 Check out all the things you can do from your phone or tablet: • Connect to the Office 365 admin center from anywhere • Add, edit, block, and delete users • Reset passwords • Assign product licenses • Turn on notifications to get service alerts and new messages • Contact Microsoft support • Sign in to manage multiple Office 365 organizations • Read the latest messages from the Message center • If you're a Microsoft Partner, manage your Office 365 customers The Office 365 Admin app supports Azure Active Directory Multi-Factor Authentication and includes the option to set a unique application-specific PIN code. We're listening. Tell us what you like, what we can do better, and what features you'd like to see next. 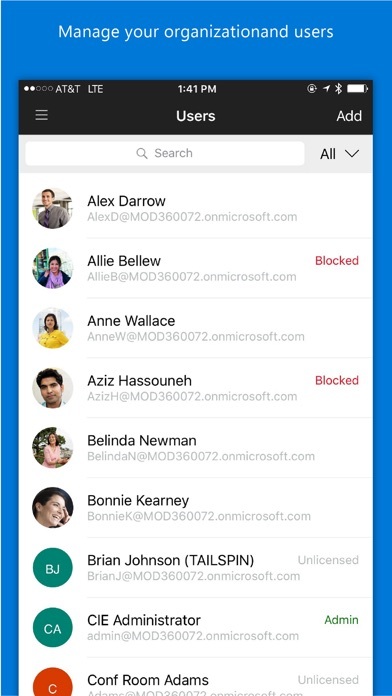 Send your feedback to feedback365@microsoft.com. 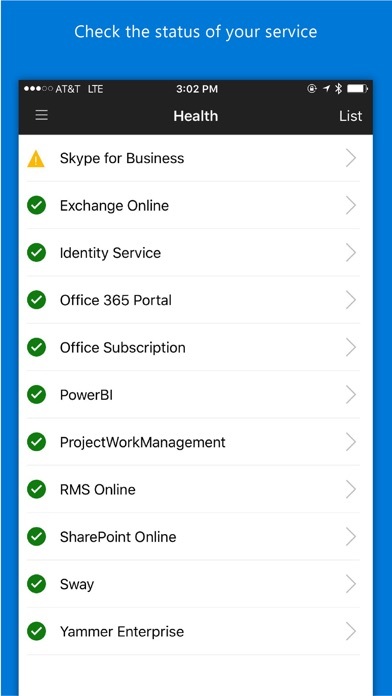 IMPORTANT: You need to be an Office 365 admin with an active Office 365 business subscription to use this app. 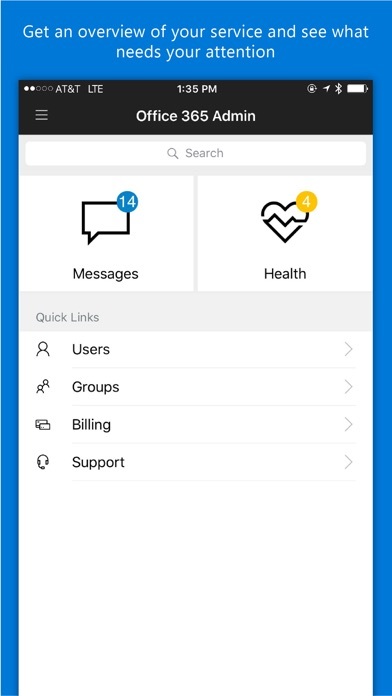 This app is required for anyone managing O365. I use it all the time. The loss of a star is the lack of support for newer phones. It doesn’t take advantage of the bigger phone screens and there are some swipe gestures that aren’t very intuitive. Other than UI, though, the app works great. When update for iOS, iPhone X ? This app doesn’t work anymore. Does not support iphone X screensize. Does not recognize Cloud Services Provider licenses. Most licenses appear with a generic license type name. Please update this asap, its a critical app since the admin portal online doesn’t work cery well on mobile. Good app, not updated for new iPhones. Overall the app works well and makes administrative tasks on the go much easier. The only issue is that it has not been updated for the new iPhone displays and scales strangely sometimes. And the screen size has never been updated to the new iPhone models (X/XS). Besides, it’s a simple but straightforward app for MS admins. IPhone xs Max screen support? This app needs to be updated for the new iPad Pro and the new user account emails have got to be better formatted.